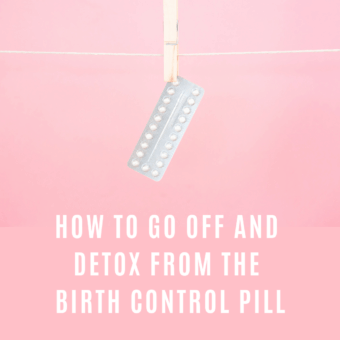 This blog post is in collaboration with iHerb but all opinions are my own. Summer rolls have a special place in my heart. When thinking back to my early blogging days, I often hesitated with what I was writing and putting out into the world. Maybe other bloggers can relate, but hitting ‘publish’ on a new post provides a varying rush of adrenaline, depending on how controversial or personal the post may be. In the beginning of my blogging journey, I felt a rush with every new post… which makes me laugh but after a year of consistently posting three times per week, my voice started to shine through and I gained more confidence, even though I was still second-guessing my words, re-writing each post 5 times and reading it over 10 before I felt comfortable hitting ‘publish’. 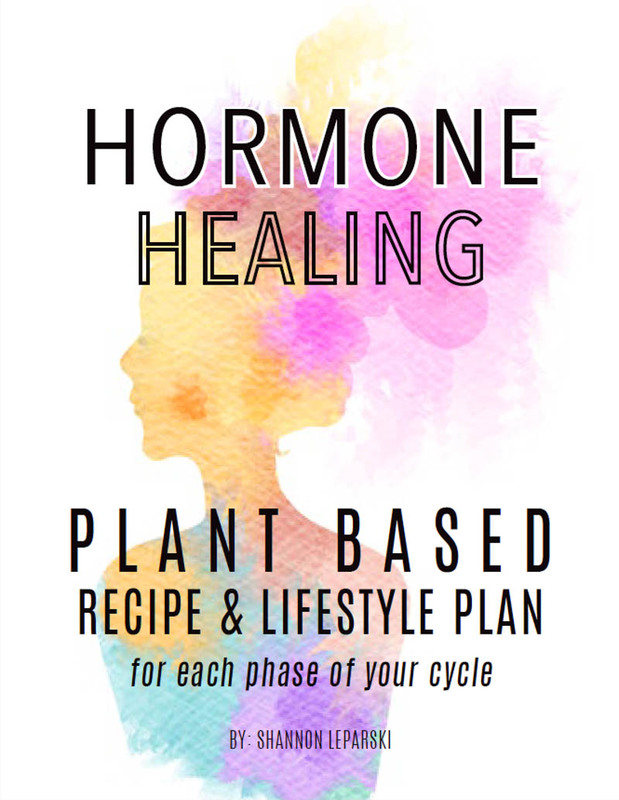 Everything about the plant based lifestyle was new to me; I didn’t want to share anything misleading or wrong! In a way, blogging has helped me overcome this need to please everyone and never say the wrong thing, which was the root cause of my hesitation to begin with. There’s a special moment during my first year of blogging that sticks out in my mind. Instead of the usual hesitation and second-guessing, I felt proud to hit publish. 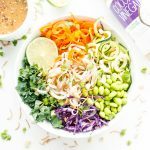 This particular post happened to be for Spring Rolls with Spicy Peanut Sauce (which I still make to this day!). I was proud of the pictures, colorful veggies and savory sauce, and couldn’t wait to share it with the world. Weeks later, I noticed my spring rolls getting pinned like crazy! I caught a tiny glimmer of my hard work paying off… which worked wonders for my motivation. There’s no way to know if a recipe will turn out to be a flop, go viral or land somewhere in between… all you can do is put in the creative work, be yourself and hope for the best! Three months later, Jenna Marbles and Julien Solomita made my spring roll recipe in a YouTube video. Wait, whaaaa?! Jenna Marbles made one of MY recipes??? That extra little glimmer of success fueled me to keep blogging and here we are, 3 years later. THAT is why spring rolls have a special place in my ♥. Since that spring roll post, I’ve been informed they are not in fact called spring rolls but rather, summer rolls. 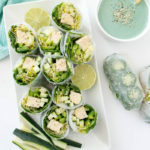 Summer rolls are similar to spring rolls but tend to be healthier since they’re not cooked or fried, but eaten raw, keeping all the vitamins and nutrients from the fresh veggies and fruits intact! 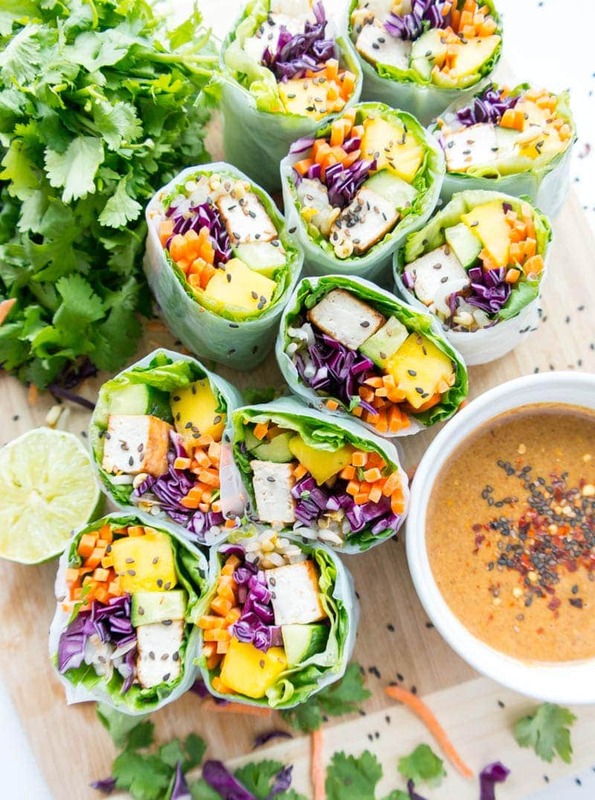 Summer rolls ALL THE WAY. 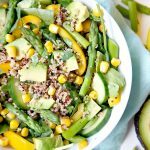 Plus with the warmer weather coming, it’s only natural to be craving lighter foods, so these are perfect. 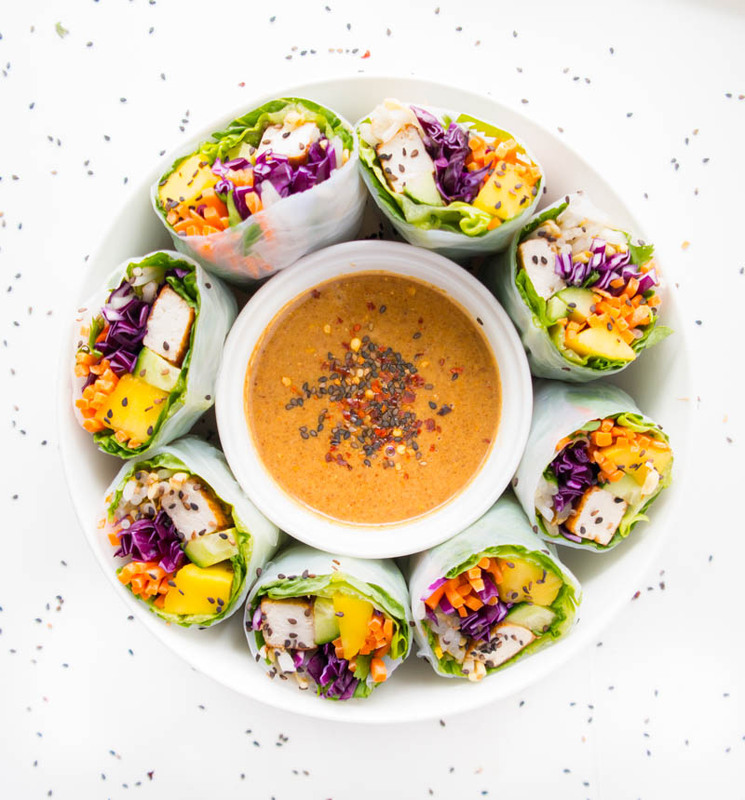 So today, we have a brand new recipe for ‘Tofu Veggie Summer Rolls with Spicy Almond Butter Sauce’. 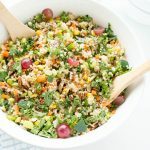 People go crazy for them at parties, Terry requests them more than any other recipe here on the blog and I love making/sharing healthy food. It’s a win-win all around! 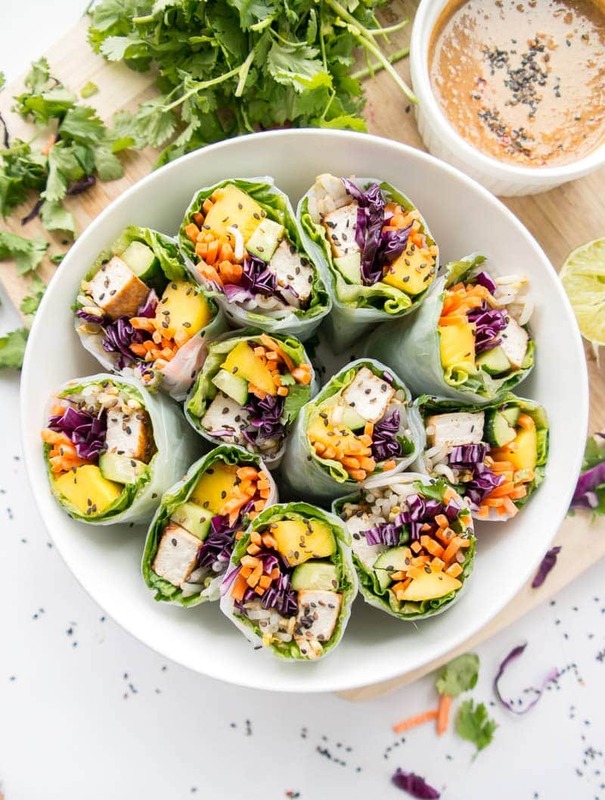 These yummy rolls are filled with raw crunchy veggies like cucumber, red cabbage, romaine and shredded carrots plus juicy mango, crispy tofu and fresh cilantro. This recipe is the version I make most often, especially for parties because they hit on all the taste notes. Fresh and savory with a hint of sweet. Light and crunchy but also filling, in the best way. Seriously satisfying. Not to mention their gorgeous color and presentation… no wonder I love them so much! 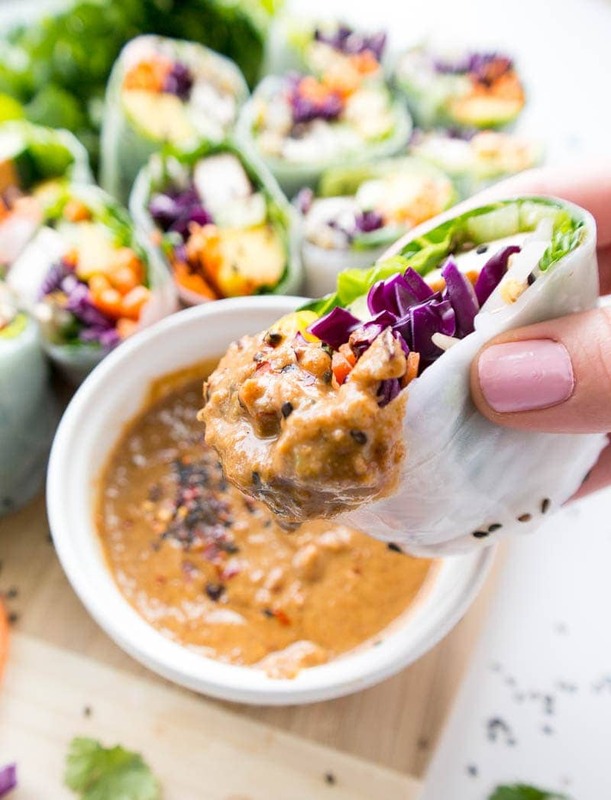 We need to talk about the Spicy Almond Butter Sauce… it is everything. Sometimes, I like a change from the usual peanut butter base but that’s a tough shoe to fill, ya know?! Almond butter has no problem filling pb’s shoes. It’s next-level for a summer roll dipping sauce base. Even more savory and rich, if you can imagine, and similar to my Spicy Almond Butter Dressing. I went with Justin’s Almond Butter because it’s one of my TOP faves. Whisked with Eden Organic Tamari sauce (it’s a gluten free soy sauce alternative! 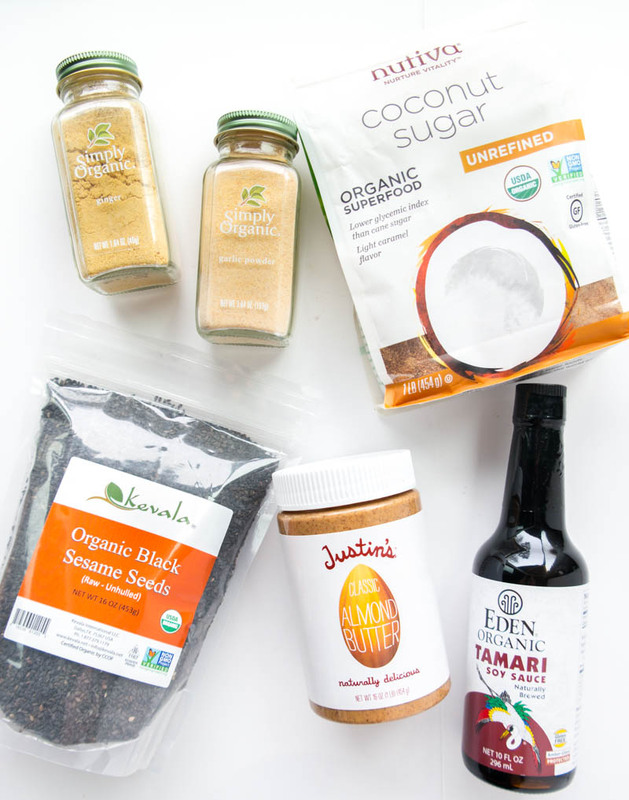 ), unrefined coconut sugar from Nutiva, ground ginger and garlic powder from Simply Organic, coconut vinegar, fresh lime, sriracha, then sprinkled with black sesame seeds and crushed red pepper flakes for extra spiciness! Think the creamiest, most luxuriously rich sauce EVER, with a tangy twist. People worry that summer rolls are hard to make. They’re not hard, just a little time-consuming but SO worth it. I think rolling the summer rolls takes some practice and I still manage to screw them up from time to time if I’m rushing, but they ALWAYS taste amazing, which is all that really matters anyway. Prep/cook the tofu beforehand (or buy baked tofu) and the Spicy Almond Butter Sauce too. Have all the veggies, fruit and fillings pre-cut. Make a rolling station. You’ll need space for soaking the rice paper (I like to use a 9×9 in. 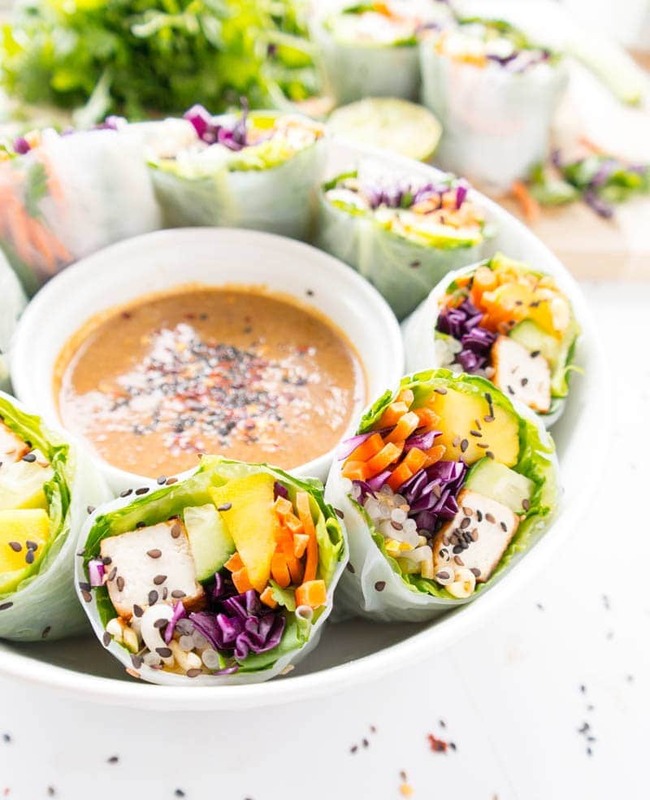 brownie pan or large bowl), a large plate or board with all the veggies/fillings laid out, a flat surface to roll the summer rolls on PLUS a separate plate/dish lined with a wet paper towel to keep the finished summer rolls from sticking together. Soak the rice paper in lukewarm water, not hot or freezing cold water. It helps if your hands are wet while rolling the rice paper, which prevents the paper from sticking to your fingers and potentially tearing. 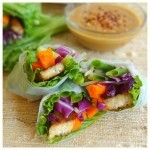 I normally wrap them twice because I like to pack in a lot of veggies and the rice paper can tear easily. Twice is key! Drain the package of tofu then cut into 1-inch strips (the short way). Lay 2 paper towels (or one clean kitchen towel) on a baking sheet. Place tofu strips on layer of paper towels. Lay 2 more paper towels on top of tofu. Place another baking sheet (or heavy flat-bottomed object) plus a fairly heavy book on top of that. Set aside for 30 minutes. This absorbs excess water in tofu. You could also use a tofu press. Heat coconut oil in a large pan over medium high heat and start sautéing the tofu, about 4 minutes on each side, until its golden brown. Meanwhile, chop up vegetables and lay them out on a plate/cutting board. Next, prepare the Spicy Almond Butter Sauce by whisking all ingredients together in a small bowl, adding more warm water as needed, to desired consistency. Now, we can start assembling our summer roll. Soak 1 rice paper in a wide pan/bowl filled with lukewarm water. Allow rice paper to soften then lay flat on a non-stick cutting board. 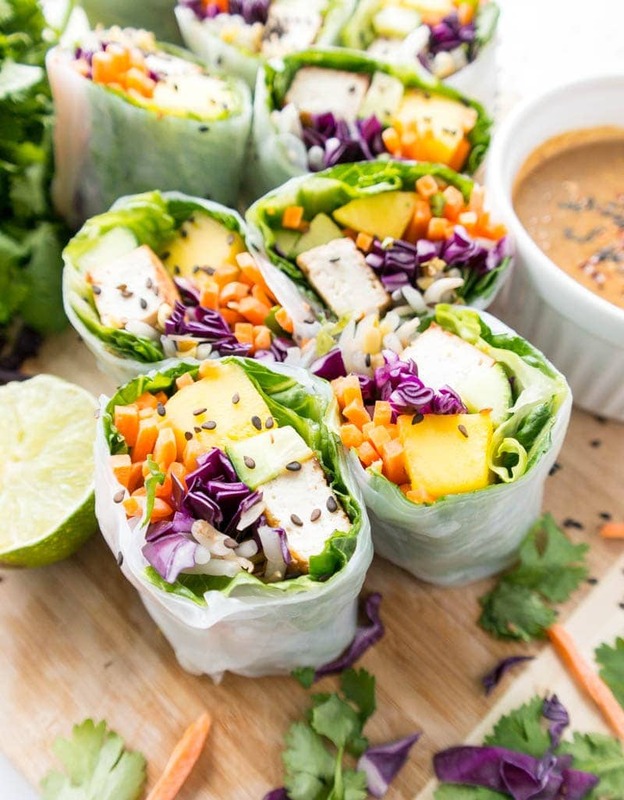 Arrange veggies/fruits in the center of rice paper, closest to you – in no specific order, but I usually start with the romaine, crispy tofu, cucumber, mango, cabbage, carrots, sprouts and cilantro. Roll forward, tucking inward and gently folding in each side as you go. Continue rolling to the end, then lay seam down. You can roll once more in another soaked sheet of rice paper or leave as is, depending if the paper is ripping or not. Continue process for 5 more rolls, or until all the veggies have been used up! Cut in half or leave whole. 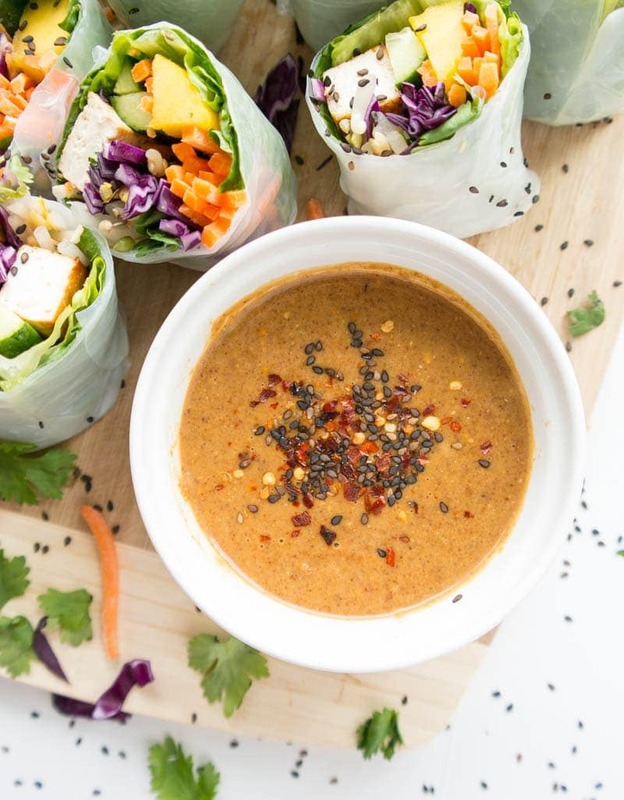 Dip summer rolls in spicy sauce and enjoy! If refrigerating leftovers, make sure they are wrapped in plastic wrap and sealed in an airtight container. * You will probably have leftover tofu. 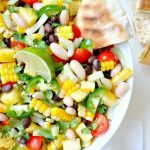 Use in a salad or glow bowl! * You can leave the tofu plain as is and not fry it in coconut oil (or use vegetable broth, but I haven’t tried that). 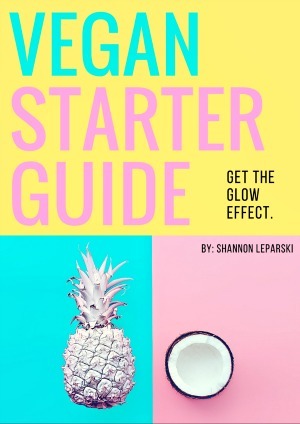 * You can use plain tempeh in place of tofu (I usually leave it plain and don’t marinate it, but you could in tamari and lime juice if you want). Don’t forget to check out iHerb for easy access to many of the ingredients called for in this recipe! Plus new Customers can click here to get $5 off their first order! Made these today. OMG, these are delicious!!! I will definitely be making these again. Thank you for the wonderful recipe. I finally got around to making these. I made them Sunday night and had them for lunch yesterday and will again today (I only made a half batch). Delicious! 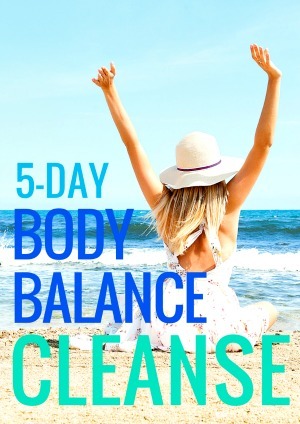 I can totally see making these part of my routine.